We write this today as leaders of our denomination – and specifically as leaders who are women – to address the harassment and abuse stories being shared via the #MeToo and #ChurchToo hashtags. For many, this movement has been both empowering and triggering, as people find themselves reliving sexual trauma from their past. We stand with all who have been victims of assault and objectification in the Church and beyond. While it goes without saying that healthy boundary training, child protection training and criminal background checks are the responsibility of every congregation and council, we are called in this unique time to seek a deeper cultural shift. We are called to stand up against a world that allows predators to flourish and victims to be shamed into silence. The Church is called to be what the world is not: safe, life-giving, and willing to hold people accountable. I Believe You – a film exploring the stories of survivors of domestic abuse how faith groups might address their needs. Culturally, we must come to terms with the all ways we victimize and objectify people, including actions that are often less noticeable. We have to be willing to examine and confess implicit gender biases that show themselves, among other ways, in pay disparities and comments about personal appearance. While the stories being shared in the media are representative of perhaps the most egregious forms of sexual violence, gender bias must be disrupted everywhere it presents itself. We must be a church committed to gender equity in all areas of our life together. 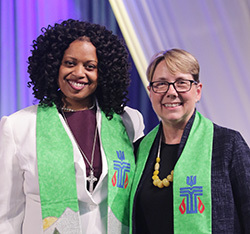 We humbly ask that the Presbyterian Church USA continue to be a Church in prayer, asking God to bring healing to the victimized, redemption and correction to the victimizer, and a cultural shift to our denomination so that we might have the abundant life promised to us by Jesus Christ.